I choose a default font for the form. Note there are many many properties that you can set for all of these objects so use your best learning aid and find the ones you need. I then create three labels. I will show one. I think the code is self-explanatory and you will be able to see what is going on. Don’t forget to the last line though! That adds it to the form, if you miss it you can spend a few minutes scratching your head wondering why it hasn’t appeared!!! But if you want to continue with this way read on!! Having created Windows Users or SQL Users using the last two days posts, today we shall add them to a role on a database. As I discussed previously I believe that to follow good practice I try to ensure that database permissions are granted by role membership and each role is created with the minimum amount of permissions required for successful execution of the task involved. So with each database having the correct roles created and the users created we just need to add the user to the database and to the role. 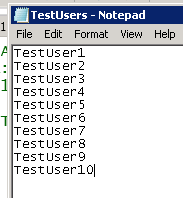 This is easily done with PowerShell. The Add-UserToRole function takes four parameters Server,Database,User and Role and does a series of error checks. With these functions you can easily create a number of Users and add them to database roles quickly and easily and repeatedly. Write-Output " $Database is not a valid database on $Server"
Write-Output " Databases on $Server are :"
Write-Output " $Role is not a valid Role on $Database on $Server "
Write-Output " Roles on $Database are:"
Write-Output "$User not a login on $server create it first"
Write-Output "$User was not a login on $Database on $server"
Write-Output "$User added to $Database on $Server and $Role Role"
Write-Output "$User added to $Role Role in $Database on $Server "
In a previous post Checking SQL Server User Role Membership we showed how to check which roles users were added to. This function allows you to add Windows Users to Server Roles. 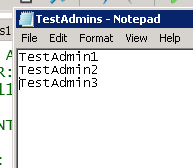 A nice simple function which can easily be piped into to allow users to be added form a list in a text file, csv file or even from Active Directory. This makes it easy to recreate Dev and Test environments and can be added to Disaster Recovery processes. 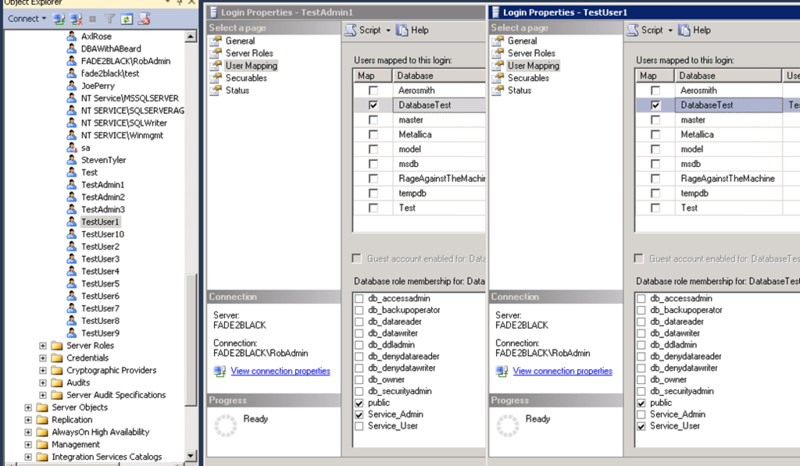 We create a Login Object, set the Logintype and create it with the Create Method. It is then added to the Role specified. Write-Output " $Role is not a valid Role on $Server"
The latest post in the PowerShell Box of tricks series is here. Auditors, managers and bosses often want proof of following processes successfully so when they come knocking on my door(I don’t have a door, it’s usually my shoulder they knock) asking when the last backups were taken I either use this function or show them the excel file my automated process creates. This depends on if I think the pretty colours in the excel sheet will impress them! Whilst I have many other methods to inform me if backups fail, sometimes someone walks up to the desk ignores the headphones in my ears (They are bright yellow FFS), eyes fixed on the screen, face deep in concentration and asks me a question. It was for times like these that the functions from this series were written. 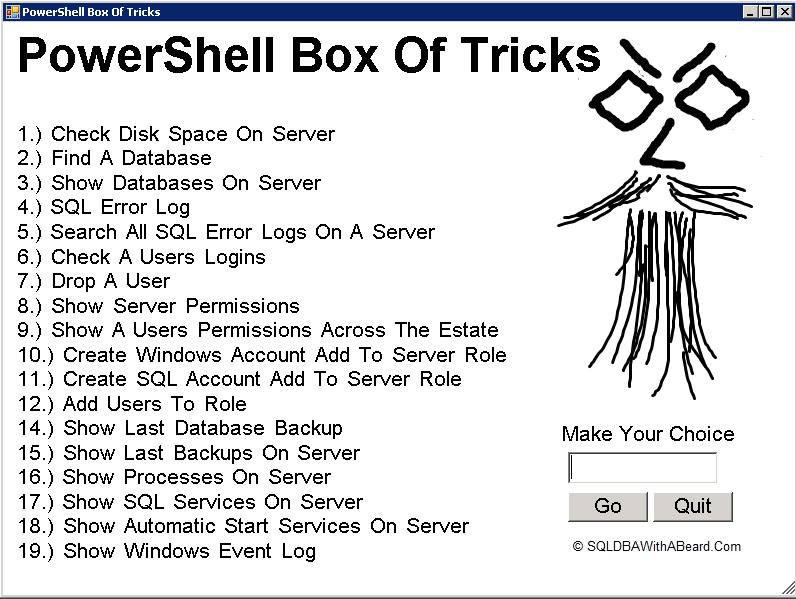 Another post in the PowerShell Box of Tricks series. Here is another script which I use to save me time and effort during my daily workload enabling me to spend more time on more important (to me) things! The SQL Server Error Logs (by default) are located in the folder Program Files\Microsoft SQL Server\MSSQL.n\MSSQL\LOG\ERRORLOG and are named as ERRORLOG.n files. The most recent has no extension the rest 1 to 6. 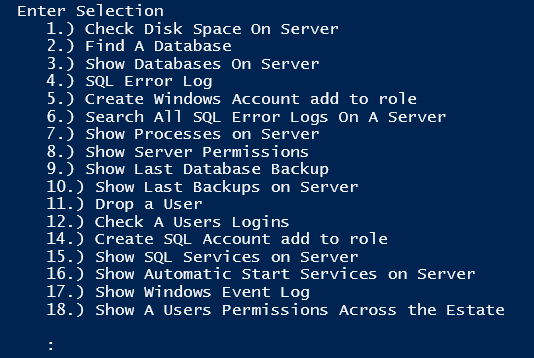 Todays post from my PowerShell Box of Tricks series is about the SQL Error Log. It is very simple as there is a method on the server property called ReadErrorLog.